What is surprising about this week’s floods is that we seem so surprised by them. Nepal is prone to water-induced disasters, we have known that for ages, and the Japanese even helped set up a whole department of government to have an early-warning and management system for floods. Yet headlines this week speak of floods ‘wreaking’ another ‘havoc’ across the country ‘unexpectedly’. We also like to call them ‘natural disasters’. They are ‘natural’ only in as much as they are caused by heavy rain. These annual monsoon floods are actually man-made, or at least exacerbated by poorly-planned infrastructure. There is a human cost to the floods mainly because we tamper with the natural flow of rivers, damage the watershed ecosystem, and obstruct drainage channels with walls and embankments. Floods are actually beneficial for farms since they wash down nutrients and replenish the soil. Farmers in the Tarai and the Indo-Gangetic plains downstream in Bihar and Bangladesh have learnt to live with annual floods. It has only become unmanageable because we have constricted rivers with flood ‘control’ levees that try to ‘tame’ rivers. We have encroached into the floodplains of rivers over which they used to spread to accommodate excess runoff. There has been massive deforestation of the fragile Chure hills directly upstream from the Tarai, which have choked with sediment the rivers that flow down from them, causing them to meander through villages and farms. Haphazard road excavation along the mountains have disturbed natural seepage, triggering landslides even after moderate rains. To summarise: so-called ‘modern’ interventions have disregarded traditional building codes and ignored the fact that a river will find its own way to the sea no matter what we do to block its path. We have turned what should be a predictable annual phenomenon beneficial for agriculture into a calamity. It is true floods are getting more destructive. But that is because we are getting in the way. Meteorologists confirm what farmers have been saying for years: that monsoons are erratic, rain doesn’t fall when it should and there is too much of it when it does fall. Cloudbursts have become more common. But even that is not ‘natural’, because the changes in weather patterns appear to be caused by climate change. Every monsoon it is the same old story. 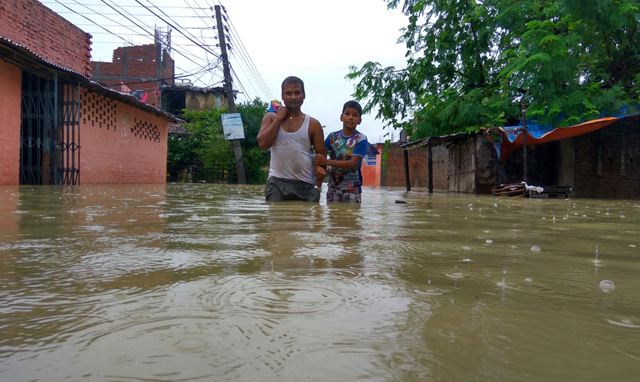 When the flood water flow into India there is always recrimination from across the border that Nepal has opened the ‘sluice gates’ of its dams. The only two dams on the border are the Kosi and Gandaki barrages and their sluice gates are controlled by India. 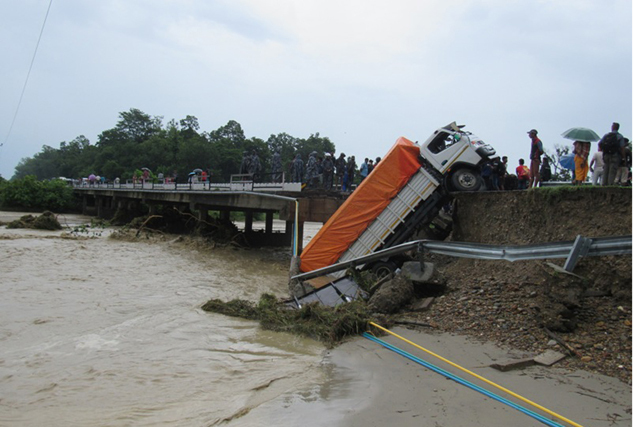 In the Nepali media, too, there is the exaggerated paranoia about embankments across the border. This week, too, we saw headlines that the floods in Morang and Saptari are because the Indians did not open the barrage gates. Actually the floods there had nothing to do with the Kosi barage. 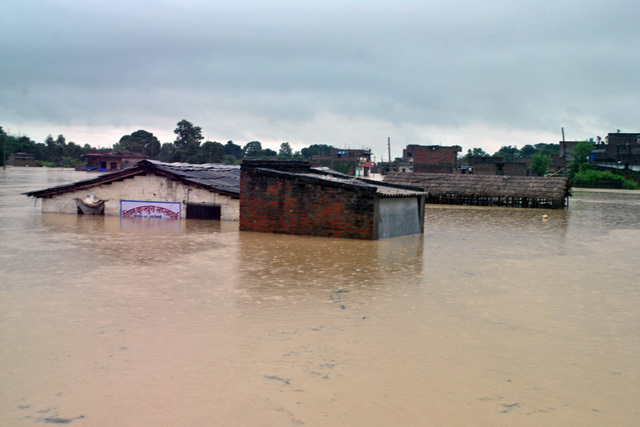 In fact, most flood damage in the Nepal Tarai and India this year were not caused by Nepal’s four main Himalayan rivers, but by flash floods on streams that flow down from Chure. The irony of it all is that the Chure was mined for gravel and sand to feed India’s infrastructure boom, and that act has made floods more destructive in India itelf. To be sure, the Kosi Barrage is a ticking time bomb, not so much for Nepal, but for Bihar. The barrage and the dykes downstream were a political and engineering folly because they allowed the Kosi’s sediment to raise the river’s bed so it is now flowing several metres above the surrounding terrain. A more serious breach in the levees, as happened in 2008, or a future flash flood could make the Kosi bypass the barrage altogether with destruction of biblical proportions. 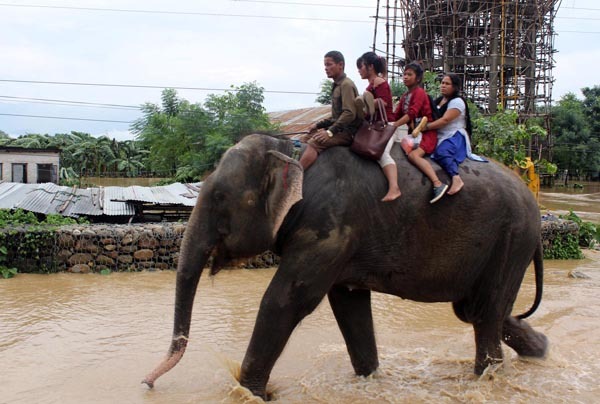 Floods and landslides will get worse in Nepal in the coming decades. Preventing them requires and understanding nature’s ways, and letting rivers be free again. Kunda is right – flooding occurs every year during the monsoon, although some years it is worse than others – it should be possible both to be better prepared and also to begin to deal with some of the factors that make flooding more devastating than it need be with better water management and restrictions on building dams and barrages. But it is also high time for an overall independent evaluation of the cost-effectiveness of the many, many programmes promoting ‘disaster resilience’ and ‘disaster preparedness’ – funded by the government of Nepal and by foreign ‘development’ agencies to the tune of millions of dollars over the years – which seem, at first sight, to have been virtually a waste of money.